I woke really early again this morning, about 4am but managed to get back to sleep and woke again at 6.40am. We grabbed our small case which we'd packed for animal kingdom lodge before leaving home and headed out to AKL to check in an hour later. We checked in and got our magic bands and went for a wander around the resort. 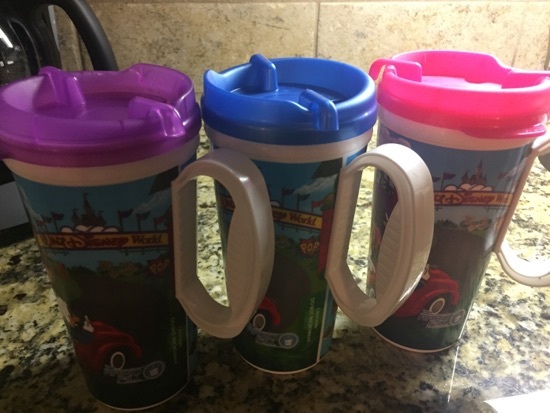 We called into The Mara to get our resort mugs and DH and I got a coffee and DD had a Coke. 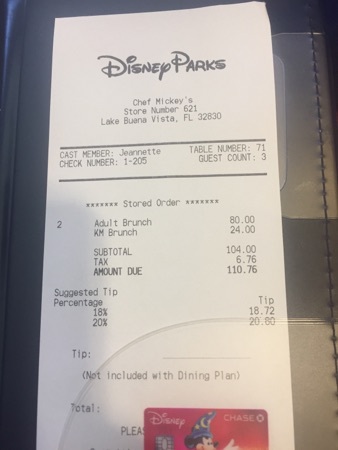 After a quick look round we headed off for our 10.05am breakfast reservation at chef mickeys. DD loved it last time we were here and was desperate to go back. 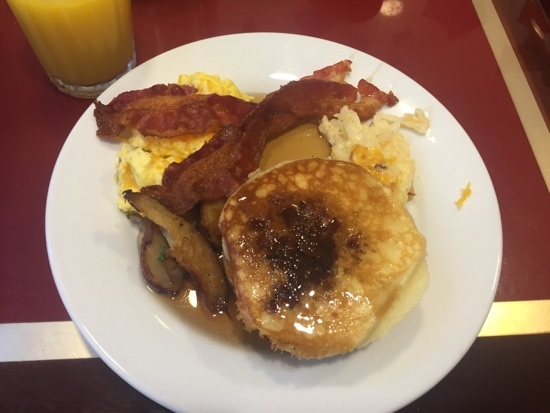 The food is pretty good and there's plenty of choice for breakfast including the usual cooked breakfast items, fruits and pastries. I had a plate of cheese and had scrambled eggs, bacon, cheesy potato casserole, Mickey waffle and pancake with maple syrup. The cheesy potato casserole was delicious! 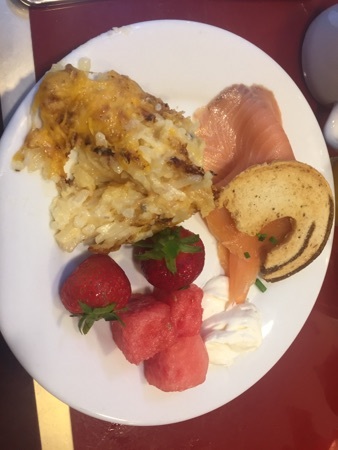 My second plate was a toasted bagel, smoked salmon and cream cheese and more cheesy potato casserole. 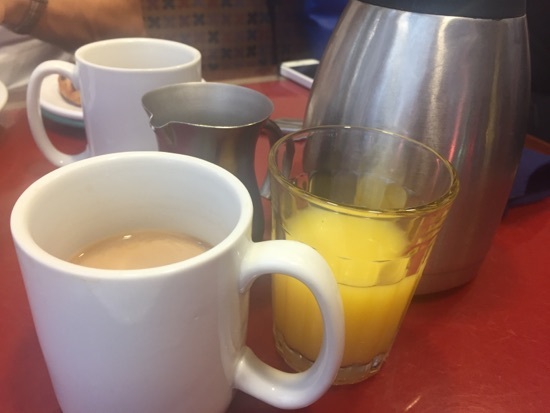 They gave us a glass of orange juice and a pot of coffee for our drinks and the orange juice was topped up frequently. 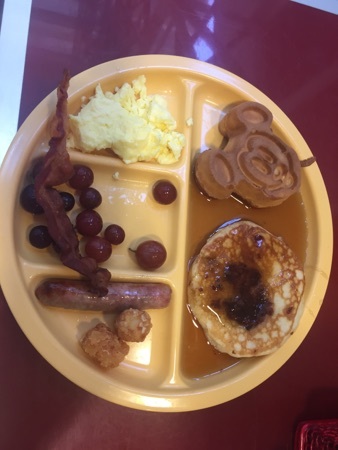 DD had scrambled eggs, bacon, sausage, tater tots, grapes, Mickey waffle and a pancake. 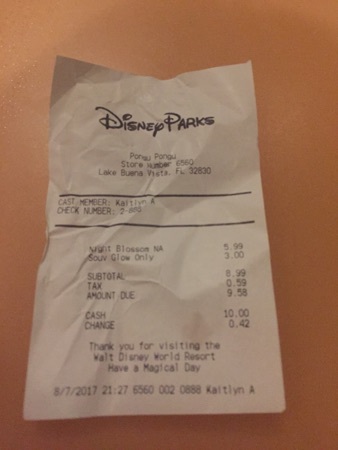 Breakfast was $40 per adult and $24 for children. Im sure I say this every time but i don't think I would pay cash to eat here at these prices but it's a great use of a snack credit. 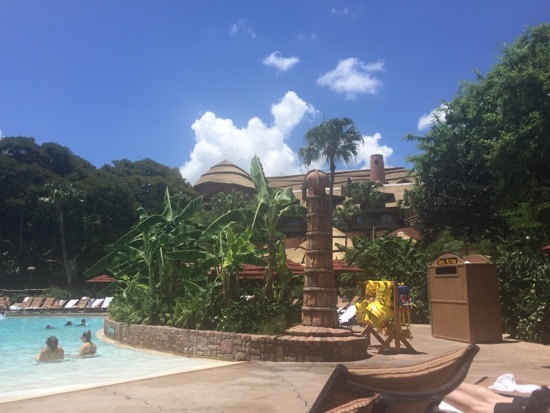 We headed back to animal kingdom lodge after breakfast and spent the afternoon in the pool. After a couple of hours in the pool we headed upto our room. We had a value studio which cost 13 points per night. We knew the rooms were the smallest DVC rooms on property and that's why they cost the least points but we were pleasantly surprised how much space there was for the 3 of us. 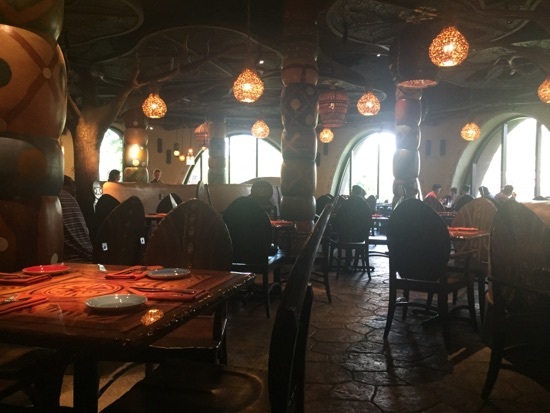 Tonight we had a 5.25pm dinner reservation at Sanaa over at kidani. We arrived 10 mins early and checked in, we went out onto the overlook to watch the animals while waiting for our pager to go off. We only waited about 10 minutes. 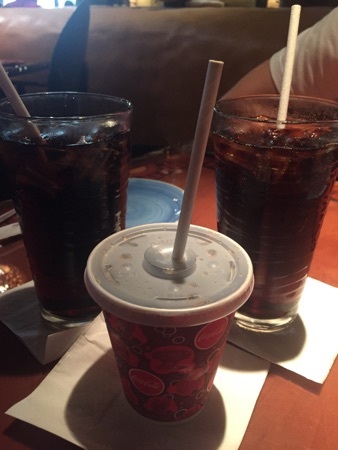 When we were seated we ordered our drinks, we all had Coke. With the deluxe dining plan you each get an appetiser, entree and dessert and non alcoholic beverage. The restaurant is really beautiful inside and has a view over the savannah. DD ordered chicken noodle soup for her starter. 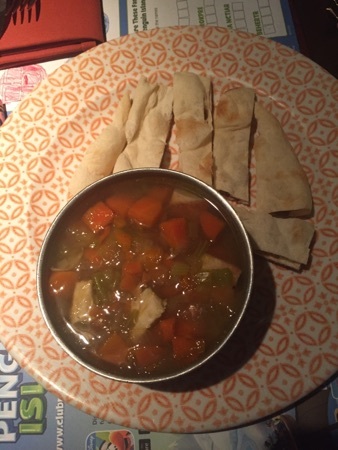 This was chicken soup with vegetables and rice. She absolutely loved this and ate pretty much all of it. It came with some toasted naan bread which she wasn't too interested in. This is a bargain for kids at $3. DH and I shared our starters. We ordered the charcuterie board. This is abit on the expensive side for what you get and costs $16. 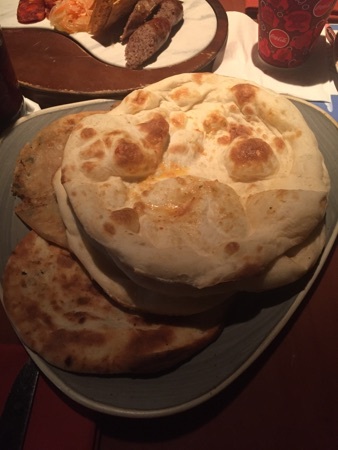 We also got the Indian bread service this was $15 and we had 5 different pieces of bread. 3 of them were naans and had a garlic oil on them, this was so good! 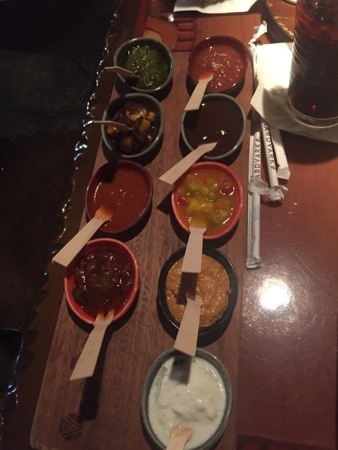 This came with 9 accompaniments. I can't remember what they all were but the 2 on the bottom left were the 2 hottest. 2nd down on the right was garlic pickle and was very good, the one at the top left was coriander, 2nd down on the right was my favourite but not sure what it was, kind of had a similar taste to hoisin sauce, the 3rd down was mango chutney then below that it was red pepper hummus which was also very good and finally minty yoghurt dip. 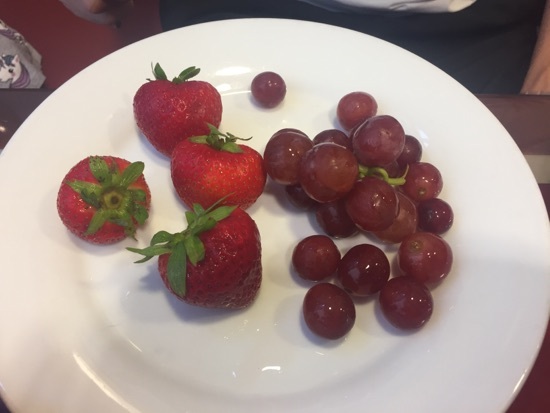 These went so well with the bread service and we really enjoyed it! We felt it is well worth the cost! 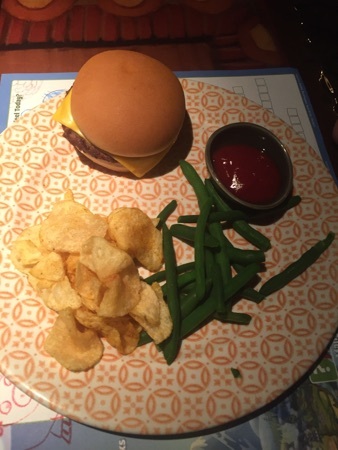 Next up was our entrees, DD had a cheeseburger which came with ready salted crisps and green beans. She didn't eat a lot of this as she was full from her soup. In hindsight we shouldn't have bothered getting her a main, 3 courses is just far too much food for a 4 year old. I ordered the potjie inspired dish. You normally choose one meat dish and one vegetable dish but on the dining plan you can pick an extra one. I think the price is $26 for the 2 with rice or $36 for the 3 with rice. 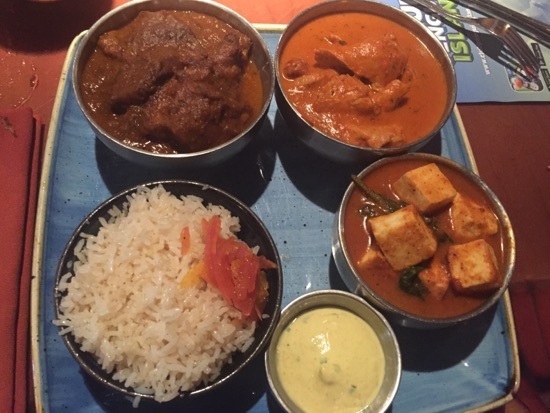 I chose the braised beef, butter chicken and paneer tikka. I didn't really like the paneer tikka, the paneer is a cheese with a taste similar to mozzarella but a texture like tofu and I just couldn't get past the texture of it. The sauce it was in was nice enough. The butter chicken was really lovely and there was so much chicken in the dish! The best though was the braised beef, the beef just fell to pieces and was so tender and the sauce was just the right richness for me. This came with white rice topped with some shredded tomato and a lime yoghurt to either cleanse your palette between dishes or to mix in with any of the hotter dishes available. 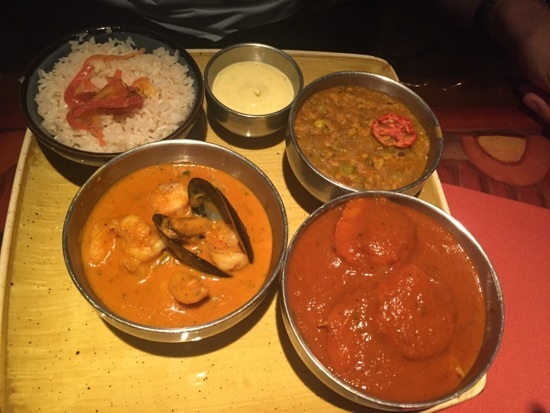 DH had the lentil Dahl (at the top), the Goan seafood curry and spicy Durban shrimp. He wasn't a fan of the seafood curry, the sauce had a strange taste, we could put our finger on what it tasted like. But he really enjoyed the other too equally. Our server brought DD over a special drink, this was fizzy orange, orange juice and milk. Sounds strange but it tasted abit like a 'Coke float' but with Fanta. 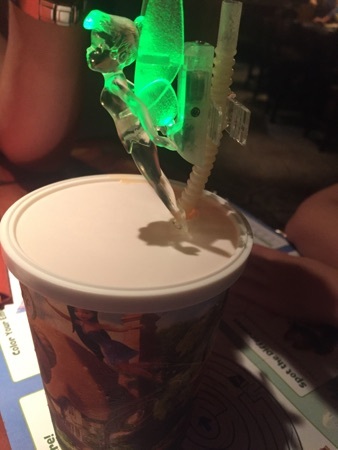 DD liked it and it came in a plastic Disney cup with a light up tinker bell. Then came dessert. I was far too full so I ordered mine to go and stashed it in the fridge back at the hotel for another time (probably breakfast - who doesn't love cake for breakfast?!). DH ordered the coffee chocolate mousse. This was a very light chocolate mousse with a hint of coffee with a dense centre of cake, covered in a chocolate ganache. DH managed it all somehow, I tried it and it was really good! I couldn't have managed any more than a spoonful though as I was stuffed. 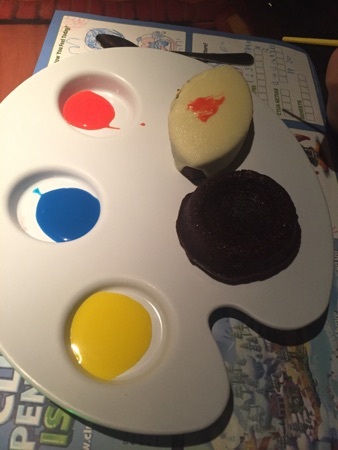 DD had the paint your own brownie. This was 3 different colours of icing and a white chocolate covered brownie and a chocolate brownie. This is loads for a child, DD painted the white chocolate brownie and we put them both in the box with my desert to eat at another time. She loved the novelty of this dessert though and had a great time messing with the icings. 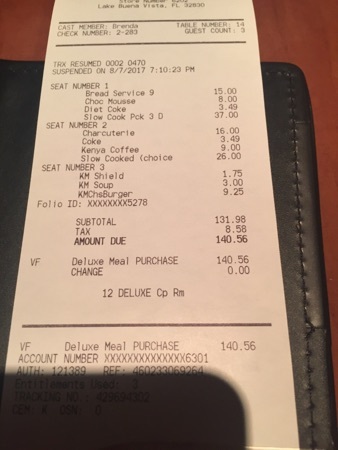 The total came to $140 and we used 3 dining credits to pay. 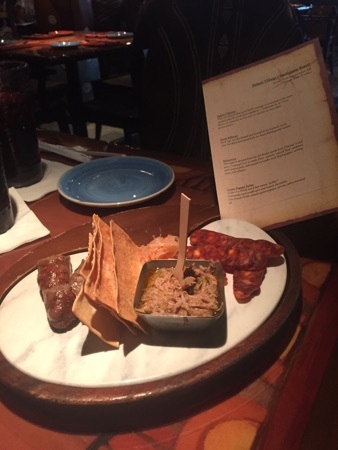 This was a great meal, we thoroughly enjoyed it, the deluxe dining plan is just so much food! Not sure we could do it for more than a couple of days. After dinner we headed to animal kingdom as I had managed to secure fastpasses for flight of passage. Oh my goodness what a fantastic ride! 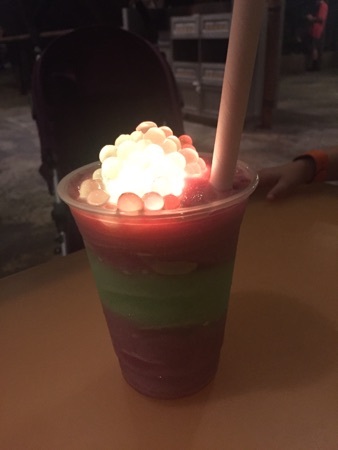 While DH was on FOP I asked DD what she would like to do and she saw people walking round with these light up drinks and decided she would like one so we found the pongu pongu window and ordered a night blossom. These are a frozen drink made with limeade, apple and pear flavours and topped with passion fruits boba balls. These pop when you bite them and the liquid inside pours out. There was a glow cube inside making the boba balls glow, they look really spectacular. We both enjoyed this, DD especially liked the balls. The drink reminded me of starbursts the sweets. This is pretty expensive at $9.58. It's $3 cheaper if you get it without a glow cube and you can also use a snack credit for it without a glow cube. We had a wander round pandora which is just amazing at night time! Can't wait to see it in daylight. We then headed back to AKL for some sleep. A good start to the day. Is this included in your Dining Plan and is it counted as a quick service or more if its a character meal? This I counted as a table service credit. On the deluxe dining plan you get 3 credits each per nights stay and hear can be used at either counter service or table service. New Photo Added by missdopey - 8 Aug 17 12:54 PM. 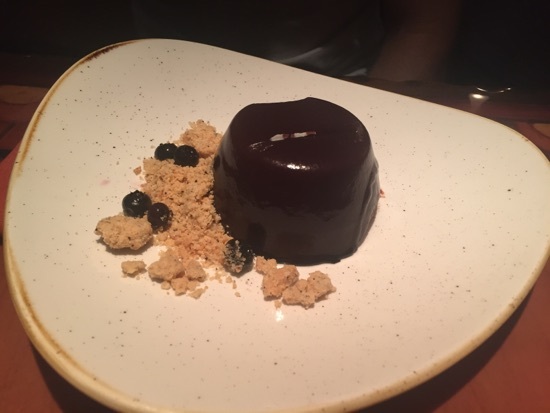 The food at Sanaa looks delicious - loads though, no wonder you need to order your dessert to take away. 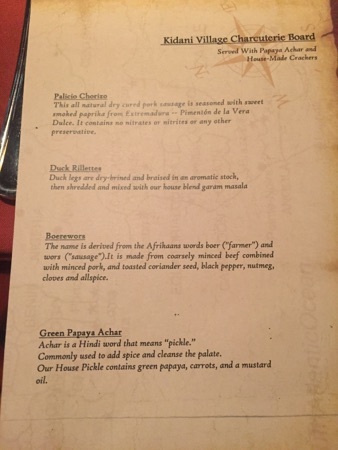 My DD (15) ordered the paneer and then told me the chicken tasted funny?! Once she knew it was cheese she merrily ate it! That Sanaa meal looks great. I would love to try the butter chicken one day.